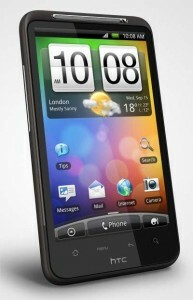 HTC’s new Desire HD smartphone aims to build on the success of the original HTC Desire. We review and compare the two phones. After the success of the original HTC Desire, HTC have been trying to take it to the next level with their new flagship HTC Desire HD. Sporting a larger screen, a higher resolution camera and various software enhancements, does the Desire HD do enough to improve on the original phone or is it simply a small incremental upgrade? In this article, we review the Desire HD and take a look at some of the key differences between the Desire HD and the original Desire. 1 What’s the overall verdict on the Desire HD? 2 What are the main changes between HTC Desire HD and the original HTC Desire? 4 What does Android 2.2 and HTC Sense add? 8 I’ve got an HTC Desire. Is it worth upgrading to the HTC Desire HD? 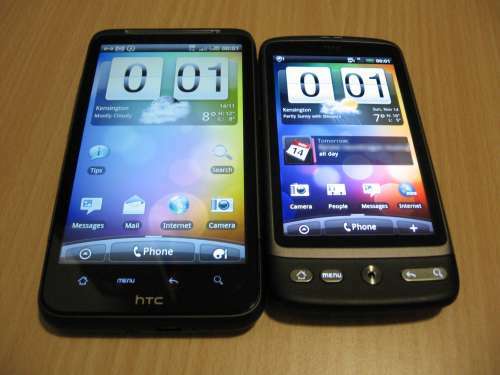 9 Should I get the HTC Desire HD or the original HTC Desire? What’s the overall verdict on the Desire HD? We love the HTC Desire HD for much the same reasons that we loved the HTC Desire. Both phones are well designed, are comfortable to hold and have a good build quality. The software on the phone is fantastic – the Desire HD has Android 2.2 (Froyo) including free turn-by-turn GPS navigation and access to over 100,000 applications through the Android Market. The Desire HD’s large 4.3-inch screen makes it particularly well suited for the Google GPS navigation service which also features information about current traffic conditions. On top of the stock Android, HTC have also added their proprietary “Sense UI” overlay which adds integration with social networks such as Facebook, provides the iconic home screen and links with the HTCSense.com website. The Desire HD, like the original Desire, is an absolute joy to use. Our only criticism is the battery life. Providing the Desire HD is charged each night, our phone would usually make it through the day OK. However, sometimes it got a little too close to comfort… especially when we would use the phone in a low signal area or make heavy use of the multimedia features. Bizarrely, even though one of the main complaints about the Desire was battery life, the Desire HD has a smaller battery capacity (1230 mAh) than the original Desire (1400 mAh). 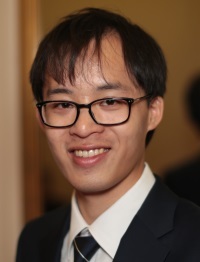 HTC justify this by claiming the Desire HD’s hardware is more energy efficient – but we wonder why HTC couldn’t have used this to extend the battery life rather than as an excuse to reduce the battery capacity. What are the main changes between HTC Desire HD and the original HTC Desire? The Desire HD has a 4.3-inch Super LCD screen whereas the original Desire has a 3.7-inch screen (AMOLED for the original edition of the Desire, Super LCD for the latest editions). Although the screen size difference might not sound that significant, the Desire HD has an extra 35% screen space to work with and it does make a difference when browsing the web, etc. Although it has a larger screen, the Desire HD and Desire both have a screen resolution of 800×480. This means you’ll get a higher pixel density on the original Desire. Personally I preferred the look of the Desire’s AMOLED screen to the Desire HD’s Super LCD screen. The Desire’s screen seems to offer much better contrast and the blacks appear more black but it’s really a matter of personal preference. See the following photo for a side-by-side comparison (both screens are on the same brightness settings).That said, some people have criticised the original Desire for having an oversaturated screen which gives unrealistic colour reproduction. Indeed, it’s probably a matter of personal preference. What does Android 2.2 and HTC Sense add? The HTC Desire HD comes with Android 2.2 (Froyo) pre-loaded as well as an updated version of HTC Sense. Android 2.2 delivers several improvements on Android 2.1 including support for Flash video on the web (including iPlayer! ), the ability to turn your phone into a wi-fi hotspot, the ability to run apps from an SD card and various performance enhancements. The main new feature in the updated HTC Sense is integration with new HTCSense.com website. HTCSense.com allows you to synchronise your data online and can help you to track and recover your phone is you lose it. There are also some nice user interface enhancements: for example it is now much easier to change skins from the homescreen, the notification bar becomes highlighted when in a call, the digital clock animates when the time changes, etc. HTC Desire users can update their phones to Android 2.2 using an over-the-air update providing it has been released by their network. However, this won’t come with the updated version of HTC Sense. The Desire HD has an 8 megapixel camera and dual LED flash. This compares to the 5 megapixel camera and a single LED flash of the original Desire. 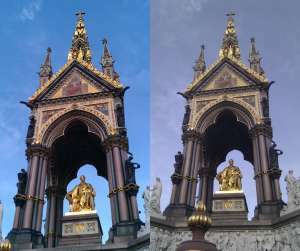 We put the cameras of both phones through their paces in Hyde Park (same lighting conditions and time, using default settings) and we did notice a huge difference in the quality of photos. Take the following example with the Desire HD’s photo on the left: the photo from the Desire HD has much better contrast and has a lot more colour. Zooming in more closely, we can see the Desire HD better captures the fine details of the leaf whereas the image from the Desire looks somewhat dull and washed out. Here’s another picture – again with the Desire HD on the left. Putting both photos side-by-side, the Desire HD certainly seems to capture much more vibrant and aesthetically pleasing photos. One of our biggest complaints about the Desire from users is the lack of internal storage. The original Desire has 512MB internal storage but once space has been taken up by Android applications and HTC’s own applications, you’re only left with about 100MB for your own apps. This isn’t a huge amount of space for apps and compound that with the fact that the Desire’s Android 2.1 (Eclair) operating system doesn’t allow you to install apps to SD card, it’s a recipe for frustrating warnings about “low storage space”. Whilst Desire users could partly counteract the problems by upgrading to Android 2.2 (Froyo) and using apps2sd, the Desire HD does away with the problem by providing 1.5GB internal storage. HTC’s “Fast Boot” works in the same way as when you put your laptop to sleep. When you turn the Desire HD off, it doesn’t really turn off… it simply enters a low-power hibernation mode. There are safe guards in place to ensure that it’ll only operate when there is a sufficient amount of battery left. If you remove the battery and force the phone to perform a “cold boot”, there is no significant speed improvement over the Desire. I’ve got an HTC Desire. Is it worth upgrading to the HTC Desire HD? If you’ve currently got the HTC Desire, chances are you’ll have at least another 12-18 months left on your contract. Whilst the Desire HD is a decent upgrade on the Desire, it’s certainly not large enough of an upgrade to warrant paying for an early upgrade. We’d recommend sticking with the Desire and waiting to see what phones HTC bring out in 2011. Should I get the HTC Desire HD or the original HTC Desire? There is no doubt that the Desire HD is an improvement on the HTC Desire – the big question is whether it’s a big enough improvement to warrant shelling out a bit extra for it. Whilst the Desire HD’s larger screen is rather nice, we can’t say that we ever complained about the Desire’s screen size. The larger screen is a “nice to have” but you certainly won’t miss it unless you’re coming from another phone with a large screen. Given you’ll have to shell out an extra £5/month or £10/month for the Desire HD on contract (which works out as between £120 and £240 over the contract), we’d personally go with the original Desire purely for cost reasons. Thanks to Three who lent us a HTC Desire HD for the purposes of this review. The version of the HTC Desire HD they supplied me appeared to have the the standard HTC firmware. You can read my guest review for Three over at their official blog.